Please read this information carefully, because your first destination will be to our partner house called Oberstdorfer Ferienwelt, which is situated nearby in the center of Oberstdorf and is also very easy to find. At the Oberstdorfer Ferienwelt, we will welcome you personally and you can check in. You will then receive the key to your apartment and to the underground parking and any important holiday information you might be interested in. After checking in at the Oberstdorfer Ferienwelt, your exclusive apartment at the market place in Oberstdorf is just a stone’s throw away. 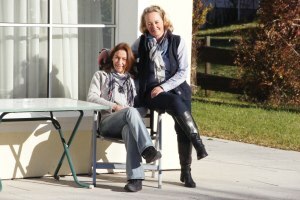 During your entire vacation, Annette and Susanne from the reception at the Oberstdorfer Ferienwelt will be your personal contact and assistants. You can then park your car in the reserved parking spot of the underground garage. The elevator brings you directly from the underground garage to your apartment. Finally, let your dream vacation begin! Check-in time is between 2:00 and 7:00 p.m. at the Oberstdorfer Ferienwelt. Departure time is until 10:00 a.m. Check out the exact journey, from the beginning of Oberstdorf to the Oberstdorfer Ferienwelt, on our interactive map.